The Personal Body Precision program is designed for anyone who wants to live a healthier life and have the figure that they desire. Whether you are a beginner or advanced trainee, female or male, the book includes workout programs designed specifically to help you reach your goals, easily and realistically. Whether you want to lose weight, sculpt a lean, firm body, or build up muscle mass, the program offers step-by-step guidelines on proper nutrition and exercise. Personal Body Precision programs are practical and easy to implement in any busy schedule. The Personal Body Precision program is diverse and comprehensive, yet extremely effective because it uses principles and approaches from various resources that have been proven easy to follow. The program considers not only your fitness goals but your level of experience and ability of exercise frequency. You can no longer claim you don't know how to do it or don't have the time! All you have to do is pick the desired body type you want and the schedule of workout routines, anything from 2-6 times a week. The diet program offers over 100 delicious foods to choose from and shows you when to eat in order to maximize your body-type goals. No counting calories or weighing foods! By selecting the proper combination of foods at the right times, you can achieve phenomenal results, guaranteed! One of the best components of the Personal Body Precision program is that it gives you all the pertinent information you need to know in order to be able to design your own advanced exercise workouts. So you'll continue to benefit for many years to come. It shows you how to train all muscle groups most effectively, how often, how many reps and sets for your specific goals. It is like having a personal trainer with you every day for the rest of your life, but without the cost. 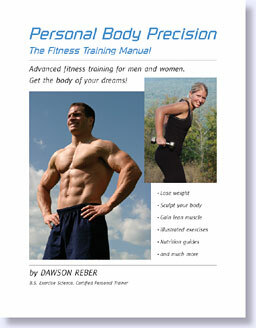 Personal Body Precision Fitness Training Manual, by J.D. Reber. 8 1/2 x 11 inches, soft cover, 114 pages, 150 b/w photos. Shipping and handling charges just $6 for all purchases up to $50 or $10 for any purchases over $50. You may remove items from your cart at any time. MA residents subject to sales tax.